As the bhavcopy software is not working as it is throwing the error “The remote server returned an error(403)”. Okie till the error got fixed what else we do? 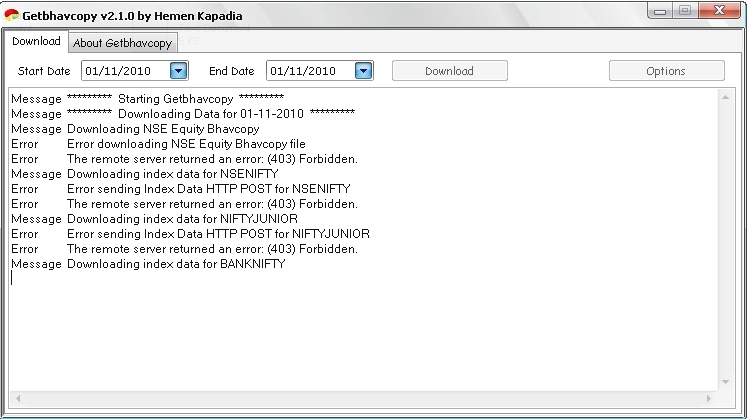 Oh my god is there no way of updating NSE EOD Data? Let look out for a temporary quick fix until the software recovers. I had manually prepared the NSE EOD Database for 01 Nov 2010 in Getbhavcopy format for my personal use and publishing the same to you. Updation will be here till the bhavcopy gets a fix. and lastly do ur data update s&pcnxnifty. i feed data to both ami and meta. Thanks my friend………is bhavcopy will get fix?? long time banknifty target…. ??? It seems to be a big problem if these things don’t get fixed. All the indices are out of my charting software! I can manage to write a VBA that will collate individual files and write it in the CSV. But I need something that will download the EOD text files for these indices into once place! That too me is more tedious than writing it on to the csv file. Volume digger has recently updated their data down loader for NSE EOD. Mr. Joydeep, author of http://www.volumedigger.com, has informed me today. It has the same format like GetBhavcopy.You need not to do any changes in settings. Its working fine now. Download the recent copy of data downloader from http://www.volumedigger.com. Thanks brother for your initiative. Appreciate your efforts.